You love flowers? You want a bright wedding theme? You like the sun? Then why don't you use sunflowers for your main wedding theme. The sunflower is a symbol of happiness, prosperity, and peace. What more can you wish for your marriage? If you want to have a bright-yellow sunflower wedding, be aware that the best time to get real sunflowers is July to September. But in case you have no problem to use silk sunflowers for the decoration, you can have this kind of a wedding around the whole year. The colors you use for the decoration and the dresses should be light colors like yellow, orange and crème. Colors that reflect the summer season and create a sunny, warm and easy feeling. You can use some red and brown dabs to loosen up the theme a bit. 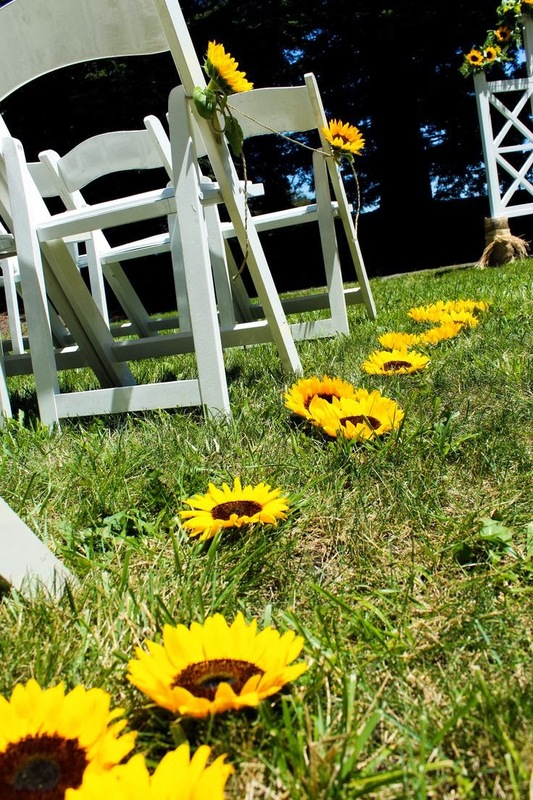 The best decoration for a sunflower wedding consists of -of course- more sunflowers. 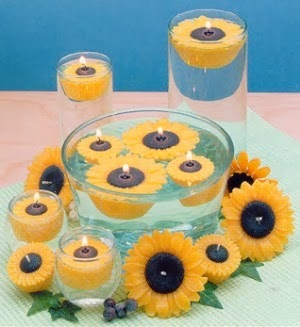 You can have sunflower candles, sunflowers printed on table cloths and napkins, sunflower lights, flower arrangements made of sunflowers (best complemented by other bright colored flowers like white roses) and much more. But there is also no real reason to stop with the decoration. 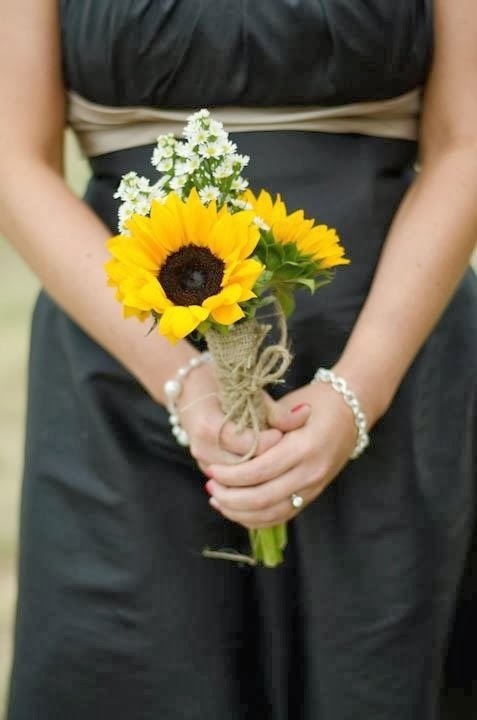 Why not use sunflower tie holders for the groom or sunflower hair pins for the bride and the bridesmaids? Or sunflower ornaments on the dresses? You have a lot of options here, so be creative. Usually each of the bridesmaids carries a single sunflower. 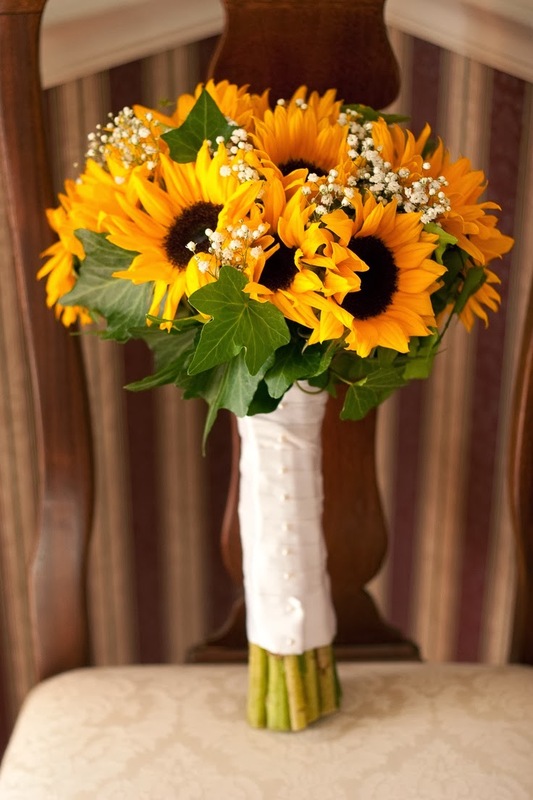 The bride has a bouquet of sunflowers, often complemented by roses or chamomiles. Ask your local florist for more ideas. He knows best what flowers he can use at the time of the year you celebrate your wedding. If you are on a budget ask him about silk flowers for the complementary flowers of your bouquet and decoration, too. 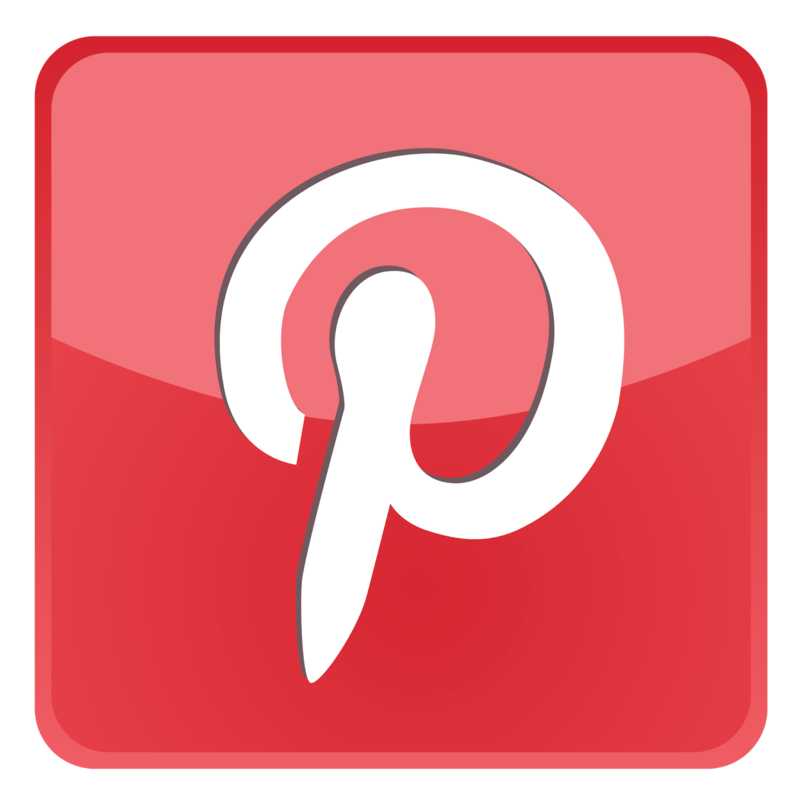 You can use your decoration for wedding favors, too. Give some extra candles like the ones you used for your table centerpieces as favors. 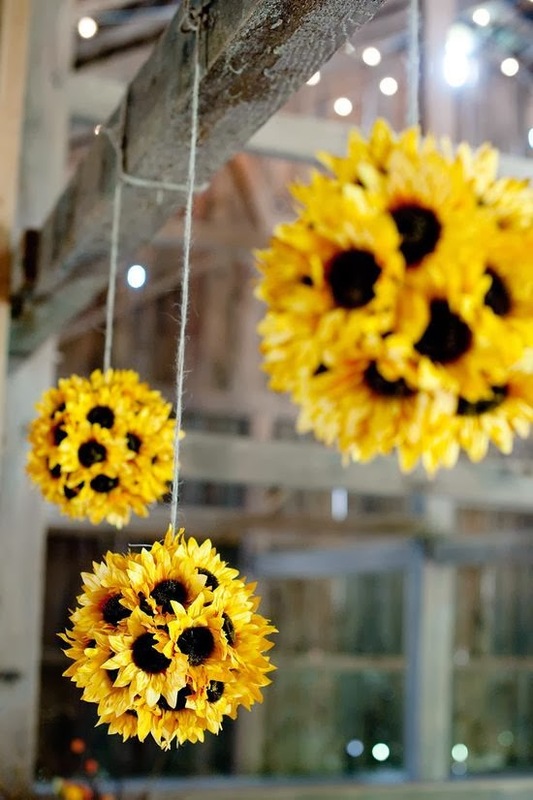 Or give your guests real sunflowers for their homes. A very nice wedding favor is a custom bagged sunflower seeds with your names and the wedding date on the bag. 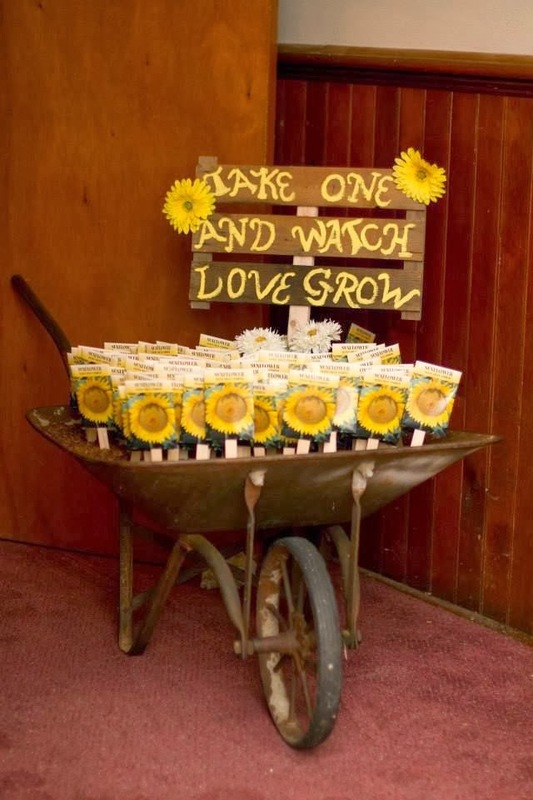 Your guests can plant the seeds next spring in their garden and will think about your wonderful special day every time they see the grown sunflower in the summer. You see how easy it is to build the decoration of your wedding reception around these beautiful plant? 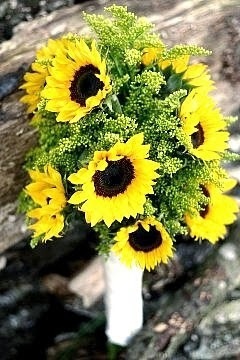 So if you are looking for a fresh, sunny and warm floral theme for your wedding, be sure to consider sunflowers.